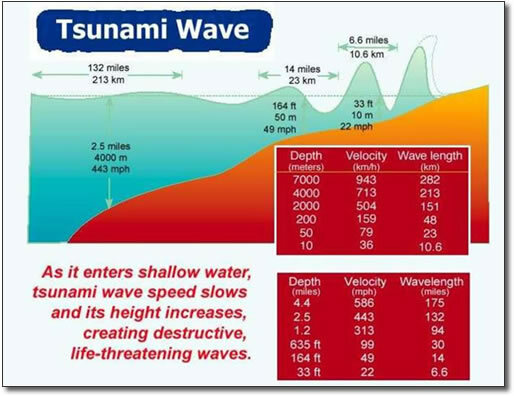 As mentioned earlier, Tsunami waves become dangerous only when they get close to the coast: the height of a Tsunami wave grows larger as the water becomes more and more shallow in a wave shoaling process. If we look at the natural causes of this phenomenon, we'll realize the shoaling process is strictly related to the wave "amplitude". An increase in wave amplitude results in "shoaling" when waves, including tsunamis, run from deep to shallow water. This is significant in coastal regions. This phenomena occurs because of the force from the seabed as it becomes shallower. This slows down the wave: the shallower the water, the slower the wave. Even when tsunamis have only a small amplitude (less than a meter) they can shoal up to many meters high as they hit shallow water. When a tsunami hits shallower coastal waters, the trough or base of the wave contacts the beach floor. As a consequence, the leading edge of the tsunami slows dramatically due to the shallower water, but the trailing part of the wave is still moving rapidly in the deeper water. The wave is compressed and its velocity slows below 80 kilometers per hour. Its wavelength diminishes to less than 20 kilometers and its amplitude is magnified many times. This piling up of tsunami energy results in growth of the wave height. As the tsunami still has a long period, this results in the tsunami taking minutes to reach it's maximum height, which could be hundreds of meters high! The form of the adjacent geography to deep water (open bays and coastline), can shape the tsunami into a step-like wave with a steep braking face. The wave height as it crashes upon a shore depends almost entirely upon the submarine topography offshore. Steeper shorelines produce higher tsunami waves. Large tsunamis have been known to rise to over 100 feet! Note 400 mph in 4000 m depth equals a large wavelength (213 km) and low amplitude. It is less than a meter usually as it passes through deep water. Because of the factors of low amplitude in deep water and large wavelength, tsunamis are often not noticed in mid-ocean. As the tsunami hits shallower water, the velocity slows, wavelength decreases and the waves height (amplitude) increases. Tsunami waves can grow up to 30 meters in height as they hit the shoreline and are followed by more waves that may even be more dangerous. Not just the crests but also the troughs can be treacherous as they form currents which take both people and entire buildings out to sea as seen in the recent tsunami in Japan.